Choosing between mini gastric bypass vs duodenal switch is a particularly difficult decision to make due to the high excess weight loss and reduction of obesity-related comorbidities. In order to make an informed decision, we separate the mini gastric bypass vs duodenal switch to educate consumers on the best choice for you. It is important to know all the advantages, benefits, disadvantages, and what to expect from each type of weight loss procedure. Mexico Bariatric Center collected the pros and cons, expected results, and long-term weight loss you can expect for both mini gastric bypass surgery and duodenal switch surgery. Mini Gastric Bypass surgery is an effective weight loss procedure which forms a new, small stomach pouch that is shaped like a tube. 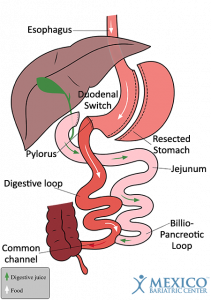 The new stomach bypasses about 20% (2 to 7 feet) of the small intestine, primarily the duodenum section. The mini gastric bypass resumes digestion with the jejunum. The Duodenal Switch surgery removes about 70% of the stomach, leaving behind a new, sleeve-shaped stomach. New stomach is “switched: to the last 40% of the small intestines. 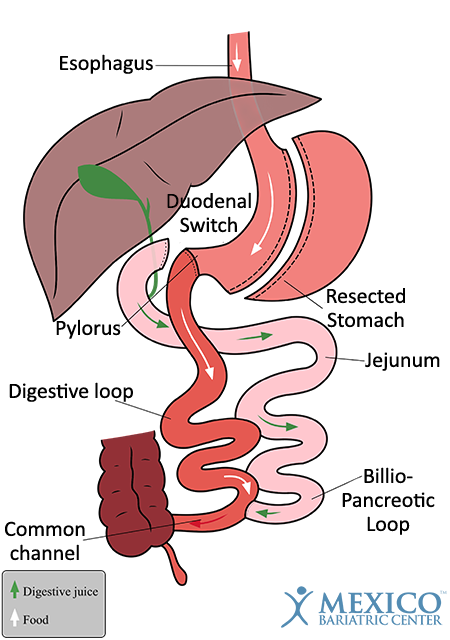 The duodenal switch resumes connection within the common channel of the small intestines. The notable difference between these two operations is that mini gastric bypass surgery on has alters the anatomy through one connection to the intestine, while duodenal switch surgery uses two connections. These connection points are called “anastomosis.” Apart from that, the mini gastric bypass provides slightly less expected excess weight loss (%EWL) than the duodenal switch. 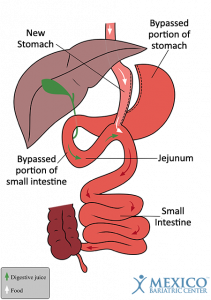 The stomach is turned into a tube-shaped, with a new smaller stomach (stoma) created with intestines. 70-85% of the stomach is removed – similar to gastric sleeve surgery. The stomach uses a single connection to the small intestine, known as single anastomosis. New stomach is “switched,” to the last 6 feet of the small intestines around to alter the digestion process and limit food absorption. Uses double anastomosis, or connections to the small intestines. Major and complicated surgery with associated risks. Leakage, bleeding, vomiting can occur. Daily supplements and vitamins needed. Most complications of any surgery. Small pouch (about 1/20-30cc) Pouch is connected to the small intestine where food and digestive juices are separated for the first 3 to 5 feet. The RNY significantly restricts the volume of food that can be eaten. Long vertical pouch (about 4-5 oz or 120-150cc). 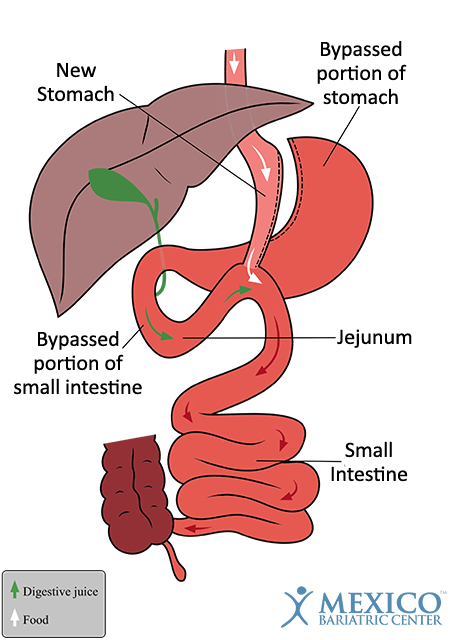 The duodenum (first portion of the small intestine) is attached to the last 6 feet of small intestine, where food and digestive juices are rejoined after 12 feet. Moderate restriction of the volume of food that can eat. Provides moderate malabsorption of fat, which can cause bloating and diarrhea. Patients must eat three meals/day. The new stomach will hold between 4-6 ounces of food instead of the average 40 ounces. The mini bypass is less complicated than the RNY because of only one connection to the intestines. The Duodenal efficacy is effective for patients with a BMI of > 50kg/m2. Those with a BMI of <45kg/m2 may lose too much weight. Patients maintained a 65% loss of excess body weight. If you have any further questions, you are welcome to contact us at any time.